Mimaki is to launch the super-wide format TS500P-3200 inkjet printer come February 2016. This 3.2-m wide roll-to-roll sublimation inkjet printer is a dedicated transfer paper printer for the textile industry and is ideal for a broad range of applications including home furnishing textiles and indoor soft signage. 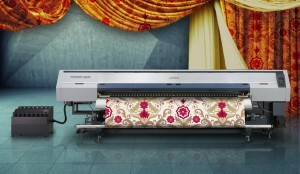 The super-wide format TS500P-3200 inkjet printer, ideal for printing on such fabrics, features a new type of printhead to deliver high-speed printing at 180 m2/h. There are 12 printheads arrayed in three staggered lines that eject ink droplets at high speed to maintain the appropriate ink droplet angle and ensure accurate drop placement with a high head gap. This ensures high-quality printing results on low-cost thin transfer papers. Mimaki’s Advanced Pass System 4 (MAPS4) anti-banding function smooths the swath boundaries with reduced numbers of droplets to provide even more beautiful printing. In addition, the newly designed Auto Media Feeder (AMF) allows stable transfer paper feeding at the high-speed setting in order to maintain print quality. In addition, the environmentally friendly output does not emit volatile organic compounds after printing and helps reduce CO2 emissions during transportation because it is lightweight and foldable. Uninterrupted printing is aided by the Nozzle Check Unit (NCU) that automatically detects and cleans clogged nozzles while the Nozzle Recovery System (NRS) uses only good nozzles as substitutes, when the clogged nozzles are not recovered after cleaning. Large ink containers in the external ink supply unit support continuous printing. Note: data in the above specifications are subject to change without notice.